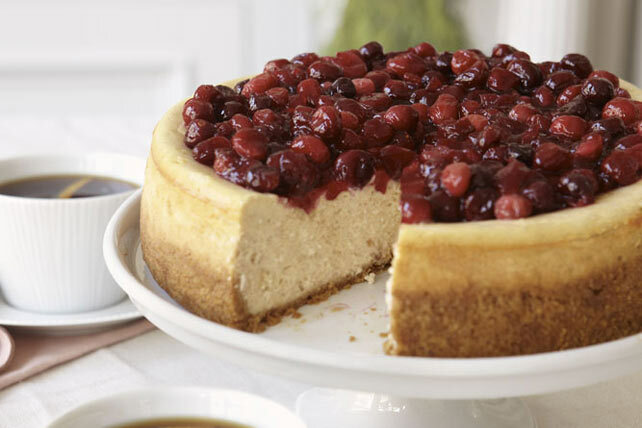 Topped with fresh cranberries, this showstopper party cheesecake is made with sour cream for a smooth and rich appeal. Beat cream cheese and granulated sugar in large bowl with mixer until blended. Add sour cream and cinnamon; mix well. Add eggs, 1 at a time, beating on low speed after each just until blended. Pour over crust. Bake 50 min. or until center is almost set. Run knife around rim of pan to loosen cake; cool before removing rim. Refrigerate cheesecake 4 hours. Meanwhile, mix 1 Tbsp. lemon juice and cornstarch; set aside. Cook cranberries, remaining brown sugar and lemon juice in saucepan on medium-high heat 7 min. or until berries soften and release their juices, stirring frequently. Stir in cornstarch mixture; cook and stir 1 min. or until thickened. Cool. Refrigerate until ready to use. Save 60 calories and 8g of total fat, including 4g of sat fat, per serving by preparing with crushed low-fat graham crackers (about 9 crackers), PHILADELPHIA Neufchatel Cheese, and BREAKSTONE'S Reduced Fat or KNUDSEN Light Sour Cream. Substitute 1/2 cup finely chopped piloncillo (Mexican brown loaf sugar) for the brown sugar.